Relevant agencies have dispatched teams across Bangkok and its vicinity to carry out a water spraying campaign to help control high levels of particulate matter or PM 2.5 pollution. 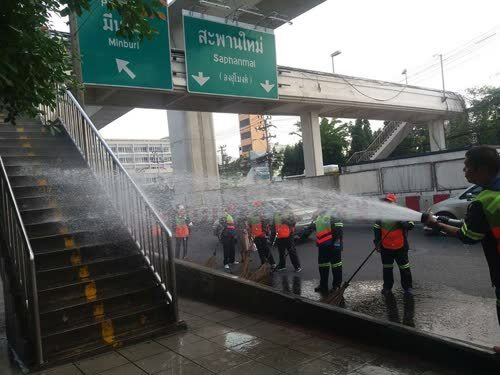 Ratchatewi district officials assisted by soldiers from the 12th Army Communications Regiment, have already undertaken the spraying of water in the area stretching from Pratunam intersection to Ratchaprarop road, and are to continue in areas such as Sathorn road, Silom road, Wireless road and Rajaprasong intersection. They will be taking readings as they carry out the spraying with the intention of ending the hazardous haze that has been affecting the capital for several weeks now. Water spraying is expected to continue until January 16 and will mostly be conducted after midnight until 6 a.m. to avoid traffic congestion. A clean up of major roads will also take place in tandem with the spraying to further improve Bangkok’s atmosphere. Officials have acknowledged that the work may cause inconvenience for the public but have assured residents and visitors it is in the best interests of public health. They are asking for cooperation from the public in limiting the use of personal vehicles and for everyone to wear face masks when outdoors.